We are in love with this one. 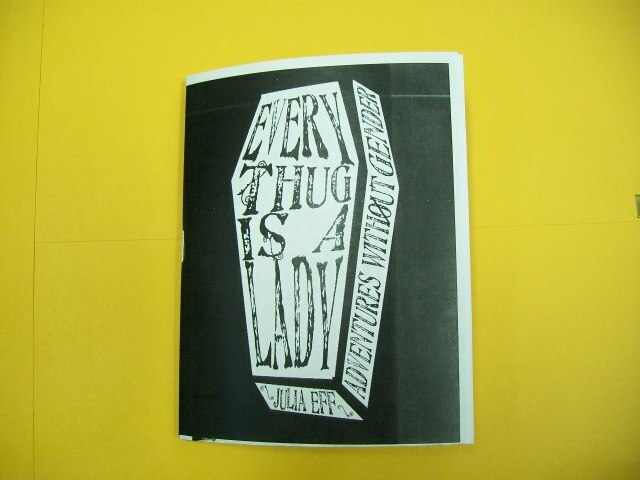 Julia Eff’s 68 page Every Thug is a Lady begins with a co-opting of a Jay-Z quote: “I’ve got 99 problems but a gender ain’t one.” Julia’s zine deals with the concept of “neutrois,” in which an individual has no gender and does not identify as either male or female. Says Julia, “Many have gender dysphoria very much like that of trans people. It is often denoted with the ‘null’ symbol meaning ’empty set. '” This look into the realm of non-gender is heavy illustrated, good-hearted, and dashed with a strong, youthful sense of humor. 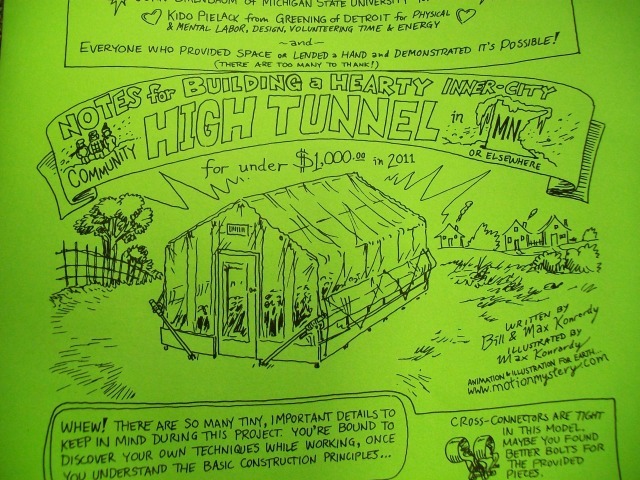 It’s also a per-zine–in the best possible sense. This is Julia’s look at life as one free of gender (though still coming to terms with it; Julia’s in the trenches, knockin’ around while the bullets fly). 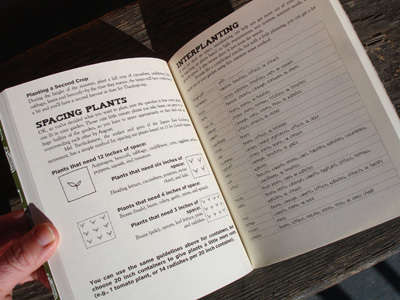 Julia writes, “I see my gender in the way people say things–it’s not a tangible object or even a thing that can be described with a giant dictionary.” This spirited, adventurous, gothy little zine is something special. Don’t miss out. Order Every Thug is a Lady here. In the name of fiscal transparency, here we have our 2011 financial report! The good news is we nearly broke even this year. We were still at a loss on January 1 but we got close. (Someday. One can dream, right?) Big thanks and hugs to everybody who stuck with us this year. It started out pretty gloomy and we all took pretty massive paycuts and had to lose our healthcare (both of which, sadly, are still in effect) but we survived to publish again! A toast to big things to come for everyone in 2012. Stay alive, stay well. OUT NOW! 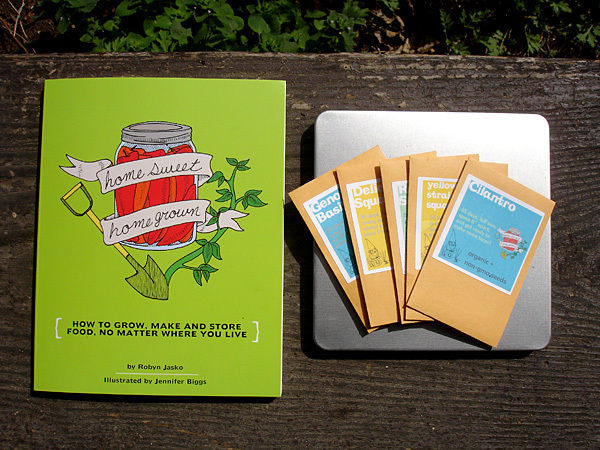 Robyn Jasko and Jennifer Biggs’ Homesweet Homegrown is self-described as “a simple DIY guide to growing, storing, and making your own food, no matter where you live.” An ideal companion to Raleigh Briggs’ DIY guide Make Your Place, Jasko and Biggs’ debut book will turn you into a healthy, happy farmer even if you live in a big city sky-rise. 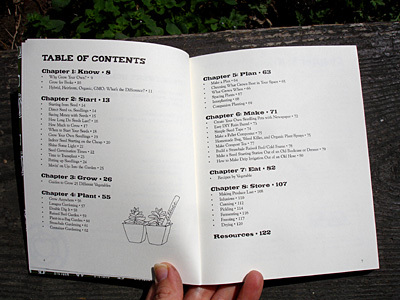 Based around eight comprehensive sections (Know, Start, Grow, Plant, Plan, Make, Eat, and Store), this wonderful 128-page guide takes you through all the steps of crop nurturing, and gives the goods for everyone from the base beginner to the well-seasoned farmhand. (The recipe section alone is enough to keep you comin’ back to this gem for years to come!) Narrated in a friendly, helpful tone by Jasko and held aloft by Biggs’ great illustrations, this book is the definition of awesomely useful. Super, super, SUPER inspiring. 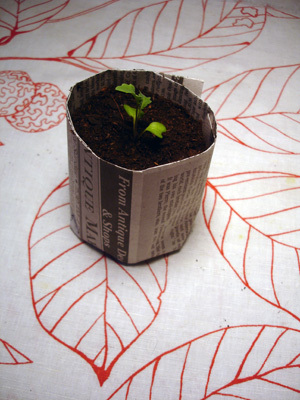 Grow your own! 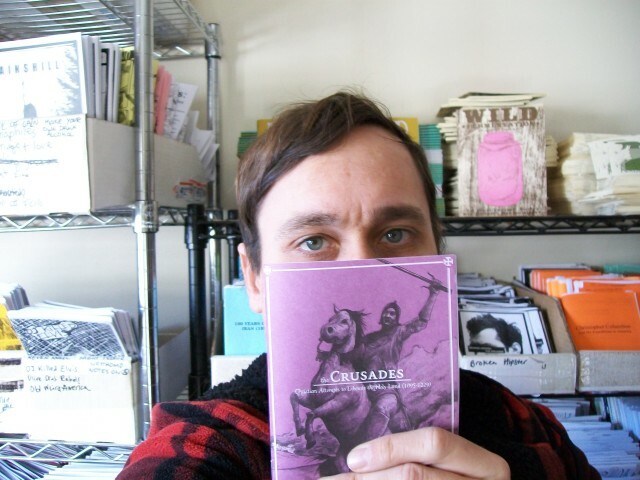 Simple History’s Crusades Zine, An Inside Look! In the new edition of J. Gerlach’s Simple History series Crusades zine we look at the period between 1095 and 1229, a time of widespread cruelty, political expansion, and religious hypocrisy. As Gerlach says in the zine’s intro, “It is said that religious differences have caused most wars. Certainly this reasoning could be applied to the Crusades—a battle of Christians against Muslims for control of the ‘Holy Land.’ But as in other ‘religious wars,’ religion was not the main reason to fight.” What comes next is an intelligent, fast-faced look at the hows and whys of this dark (and oft romanticized) spot in our history. Gerlach’s illustrated, 48-page take on the Crusades is an accessible but richly detailed piece of cultural documentation. In this day of terrorists and nationalism, oil-wars and martyrs, this text will ring true to modern readers. The big, hot button themes—jihad, imperialism, propaganda, religious fervor—are all the same and the result can be chilling. As says Gerlach, “It goes back and forth, with no end in sight.” Scary and synchronistic, this is the most relevant Simple History zine yet. 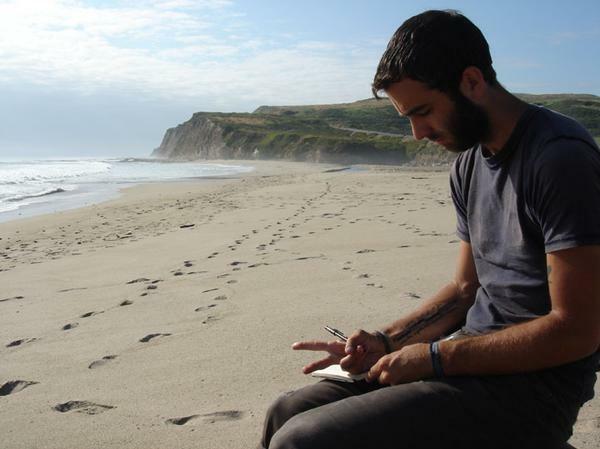 Interview with Matt Gauck of the Next Stop Adventure Zine! 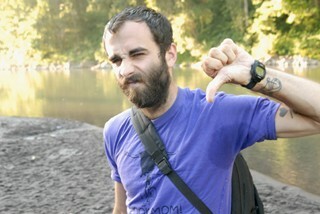 Matt Gauck just released a new issue of his zine Next Stop Adventure and man is it good. Here we talk to Matt about bike touring Alaska, running a Kickstarter campaign, and more! 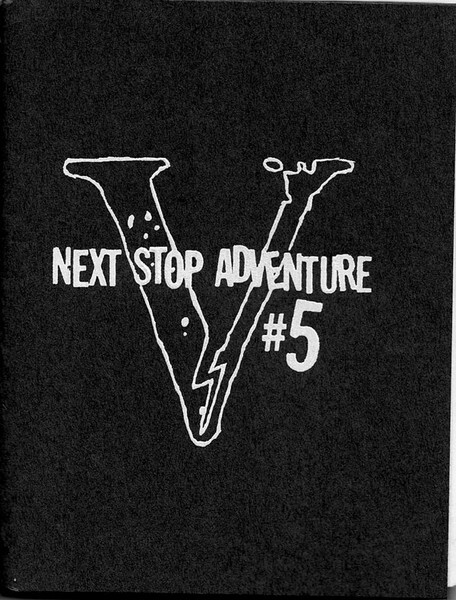 Next Stop Adventure #5 is available here! Q: So there was a Kickstarter involved with this puppy. Why did you decide to do that and how did it work for ya? A: I felt super weird about using Kickstarter–sort of like it would cheapen the whole thing, and I definitely discuss this in the first eight pages of NSA5. The basics are that I had already bought my ticket to fly to Alaska, and was going regardless, but thought building an interest in reading this zine would be beneficial, and if people could basically “pre-order” it by being involved in trip, then why not? I asked for $400, and got a little over $1200, which is totally crazy. Q: What happened after the Kickstarter campaign? You went to effing ALASKA! Do tell. A: I took my bike apart, put it in a box, flew to Alaska, and within nine hours, I was on my bike, heading north. All told, I ended up biking a little under 1000 miles over the course of three+ weeks. I camped the whole way, and I pretty much do things as cheap as possible, and this was no different. I saw a wolf twelve feet away from me within the first two miles of this trip. She looked right at me. Q: What can people expect from the new one? 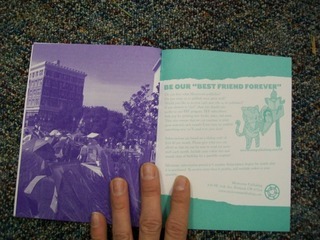 A: Funnier stories, more rain… a better layout… OH, and I screenprinted the covers, which is a nice difference. Beyond that, I think my writing has improved, and the whole zine and bike trip seem to combine well for a start>finish kind of thing. If you’re into funny bike stories and terrible camping situations, this is for you. 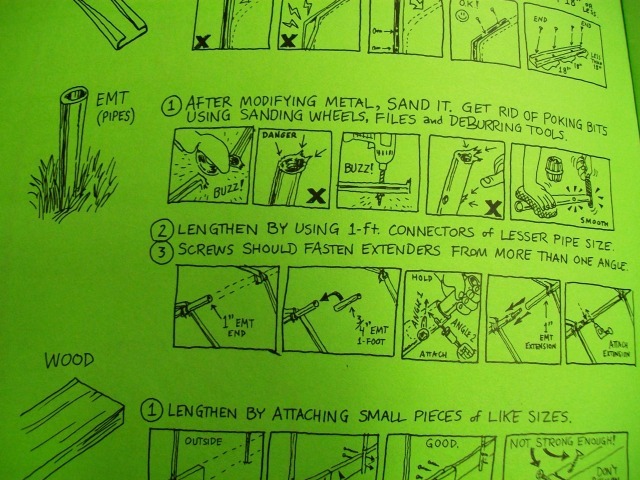 There’s also some funny off-topic stuff for the “non biking” part of the zine. A: I’m still working to fulfill some of the Kickstarter stuff, which will likely take a little while–but I’m going on tour selling merch for some friends across the majority of Western Europe and Scandanavia–then I’m planning some other trip when I get back… South America or Australia/NZ maybe… I have to fix my bike though; it’s looking pretty rough… That, and I’m really dying to build a massive tree house for 2012. 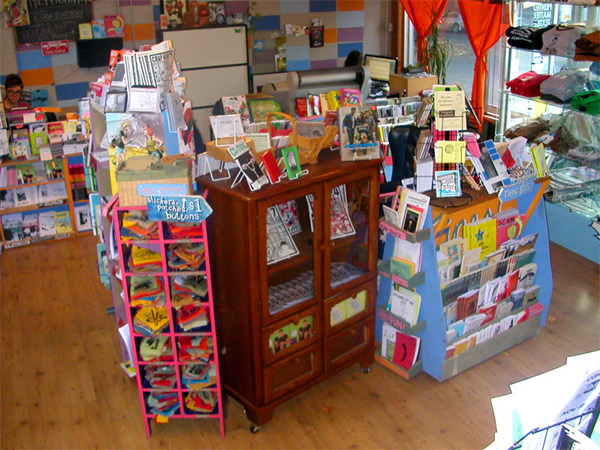 The Microcosm Bookstore at 636 SE 11th Ave in Portland has been the brick-and-mortar incarnation of our primarily digital catalog, giving customers and retailers the opportunity to thumb through zines and dive into piles of patches. In order to keep this retail presence while acknowledging the costs of maintaining the space, we’re adopting the shop into a new incarnation! By the end of January, Microcosm Bookstore will be open Wednesday & Friday 10–6 and by appointment. This allows us to more flexibly use this as an office space, doing the fun publishing work we so love, while still being available for our lovely Portland customers on a more limited basis. This includes retailers, whom we welcome to get in touch any time about making a local order. 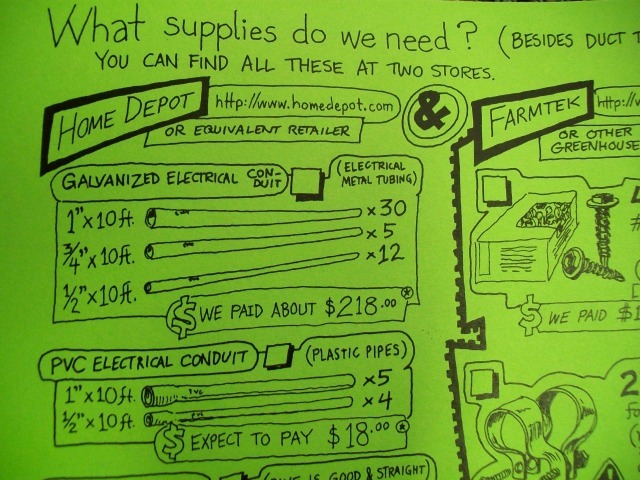 As always, you can get in touch by calling 503-232-3666 or emailing store@microcosmpublishing.com. Thanks for all the great memories at our Portland space and we hope to create more with our new setup! It’s the Rad Dad Occupy issue! In issue #21, Rad Dad editor Tomas Moniz and co. take on the recent global occupations from a radical parent’s perspective. Are potentially volatile protests like Occupy Wall Street kid-friendly? Are the folks behind the Occupy events organized enough to keep your children safe should the balance of power tip? Issue #21’s contributors tackle the topic from a variety of angles, giving a balanced, clear-eyed spectrum of advice. 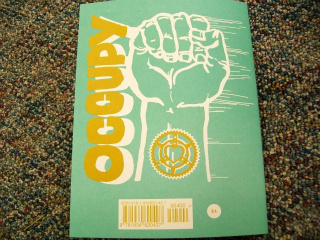 Also in this issue is a series of non-Occupy writing, including a heartfelt essay on keeping your daughter off the stripper pole, a feature about the Foxfire Book series as a remedy for end-of-empire blues, and much more! Hot on the heals of the Rad Dad book, issue 21 is a sure-fire sign that Tomas and his contributors are not slowing down any time soon. This classic for-radical-parents by-radical-parents publication is essential reading for parents and non-parents alike. Order Rad Dad #21 here.